An ongoing pre-exam question forum was maintained where students were encouraged to post questions they had while preparing for an exam. 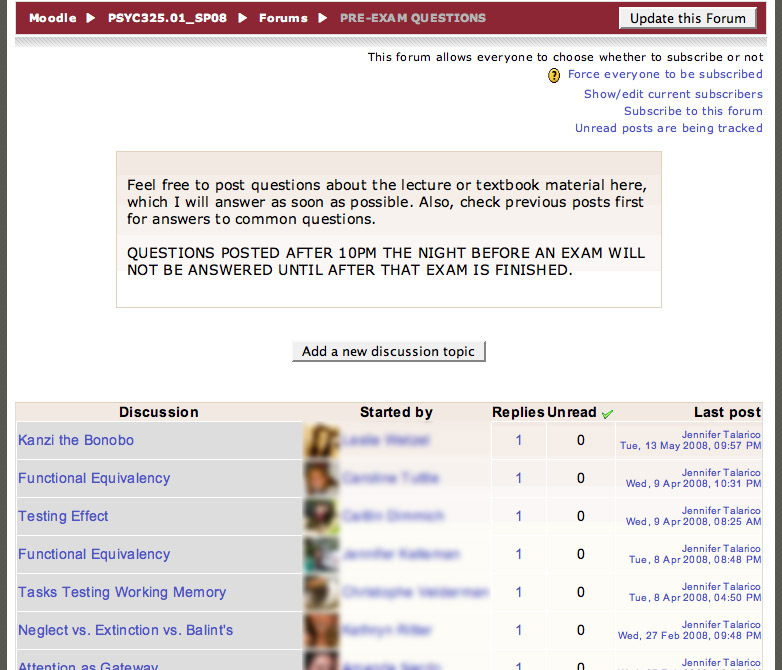 I would answer questions posted prior to 10 p.m. the night before an exam. Anything posted after 10 p.m. would be answered after the exam. They would ask questions and I could respond as the instructor such that maybe another student didn’t even realize they had that question or were confused about a particular topic. They got in a habit of checking this, and they would post here rather than emailing me. I found this easy, and it kept everything contained and saved me from answering the same or similar questions multiple times. Another thing that’s really nice is that when I teach this course again next year, and I know the types of things that are easily confused and maybe I can rephrase or reframe them in lecture. I can maintain these forums over time and create a shorthand FAQ that students in future classes can benefit from.